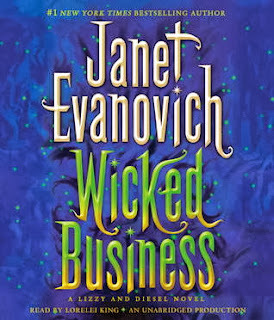 Title/Author: Wicked Business by Janet Evanovich. Synopsis: When Harvard University English professor and dyed-in-the-wool romantic Gilbert Reedy is mysteriously murderedand thrown off his fourth floor balcony, Lizzy and Diesel take up his twenty-year quest for the Luxuria Stone, an ancient relic believed by some to be infused with the power of lust. My Thoughts: Wicked Business is like an adult Scooby Doo. There are comical villains, kooky characters, a mystery and lots of hijinks. The adult part is the sexual escapades and language, although it is pretty tame. I didn't realize this was the 2nd book of the "Lizzie and Diesel Adventures," until I was pretty much into it already. 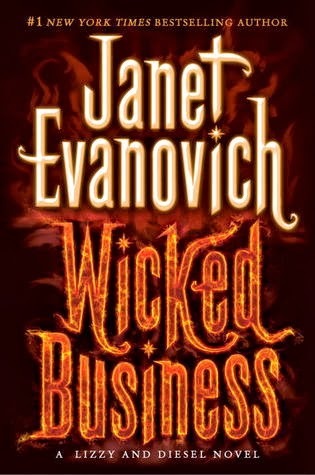 Although yes, there are some things I wasn't clear on, Wicked Business is still easy to follow and the fact that it was the second book didn't ruin any enjoyment. Although the plot was a bit confusing and lacking for me, what made up for it were the hysterical characters throughout, including a humorous counter girl always looking for love, an evil villain who is quite comical, and a monkey named Carl that flips people off just to name a few. Lizzie is the main female character in this wacky story and from what I could understand she has a power to sense power...whether an object is magical. Diesel is her male counterpart and has other powers and talents of his own. Unfortunately, they can't get together because if they get physical it would be like a bad spontaneous combustion. So there is sexual tension, flirting and some nuzzling but that's it. Their relationship is cute and I like both of them. I'm not sure I'll continue reading this series, but I'm rooting for them just the same. They go through some investigating and puzzles, search old buildings and even caverns to solve the murder mystery and to find the elusive and mystical Luxuria Stone. There is some subterfuge and doublecrossing and help from unlikely sources. Narration: Lorelai King was great. There were a lot of different characters and it was easy to distinguish who is speaking in a conversation. Once in a while, the dialogue seemed a bit forced, but the energy was up the whole time. I really think she took this story from a travesty to a comedy. If a less dynamic narrator had tackled this, I think it would have come off really poorly. I also don't know if I would have had the patience to read this in print. 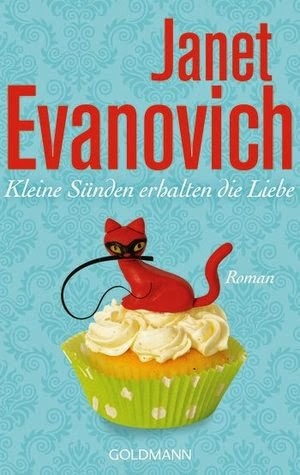 Wrap up: A cute and very light read. If you're in the mood for a silly, paranormal story, this one fits the bill, just don't expect much substance. Labels: Wicked Business. 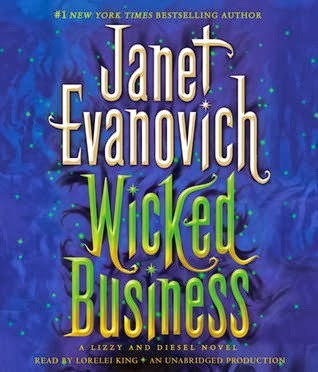 Janet Evanovich. Lizzie and Diesel. These are on my to try someday list! :) I like light and fun sometimes and Lorelei is one of my favorite narrators. I tried the first one... it was okay, but not really my thing. I looooove Stephanie Plum, but I haven't decided if I want to tackle the other series. I'm glad to hear this narrator is great. I think I'm going to try her in the future. I really enjoy the Stephanie Plum series, but wasn't sure if I'd like the Diesal books since the holiday Plums usually don't hold my interest as well as the numbered ones, but I'm all caught up on the Plums, so maybe I'll start these! I could use a laugh! Hmm I don't think this is for me. Glad you enjoyed it. I didn't even realize she had another series. Sounds fun! I have this sequel to read as well. I thought your wrap-up about the first - light but not much substance.